First picture is just for size perspective. 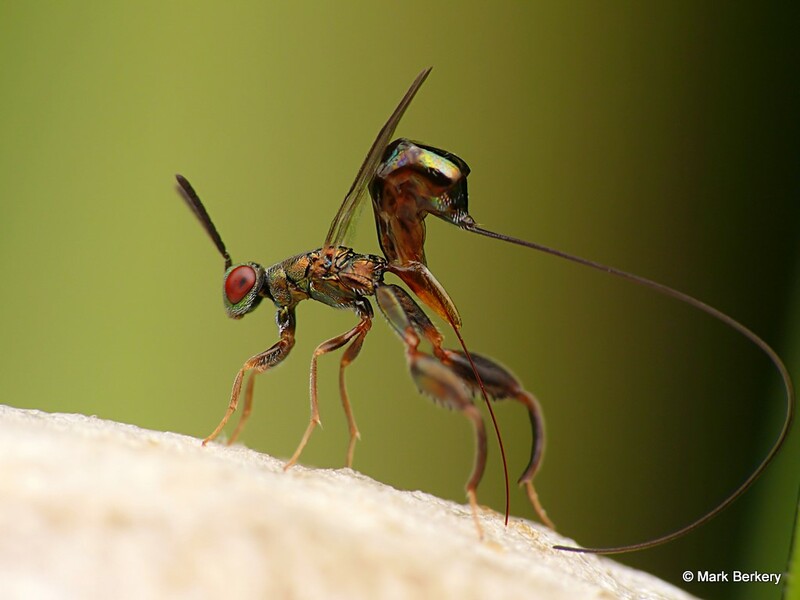 The Wasp is 3-4mm long and the ovipositor is thrice as long, standing on a one inch diameter Mantis nest, a globular foamy thing you have probably seen before. The Wasp is parasitizing the Mantis nest, or Ootheca, by first sensing with her ovipositor, smell or taste – just like us, there is something there to feed her young – every mother is concerned for the welfare of her young. The Ootheca is where the Mantis lays her eggs and they incubate. The wasp has another idea, instead of hunting something for her young to eat and building a nest she does it easy and lays in a ready made nest, the Mantis’s. She was so occupied I was able to manipulate the grass she was on to get the shot; otherwise she would probably not have let me close. Most of these small creatures are single minded when it comes to fundaments such as eating, shelter and reproduction. And unlike people they don’t make a problem of it, don’t get emotional or worrisome. Just doing what it is moved to do or must, no spanner of thought in the works. The Mantis nest is one inch in diameter and five feet up on a stem of grass in a field of grass and there is nothing to brace myself or the camera for a shot. This is what I use the stick for, amongst other things. But the first thing is to go still inside. Inside comes first, if I am still inside I am still outside – as much as possible. The value being I am not distracted by thoughts of anything but what matters to getting the shot. And what matters first is stability, of posture or platform, or focus – the inner then the outer. When I quiet my mind this way it also means I am less likely to get anxious or stressed in the often difficult process of capturing the image. When I have stability of focus – as much as possible – I accommodate the fact there is no perfection standing in a field trying to hold a camera at the top of a five foot long stick absolutely geo-stationary – it’s not possible. This is where the minute but inevitable movement has to be controlled since it can’t be eliminated, even with short working distance and lens and bug relatively stabilized in the same hand, so I move the plane of focus – less than 1mm deep – through the plane of the subject at the angle I want to capture it and shoot just as I judge it is where I want it. And it is a judgment for me. With my gear it is sometimes like shooting in the dark but you can see from my pix it works, and the keeper rate is not bad. And if this old body can do it with my cam any body can. 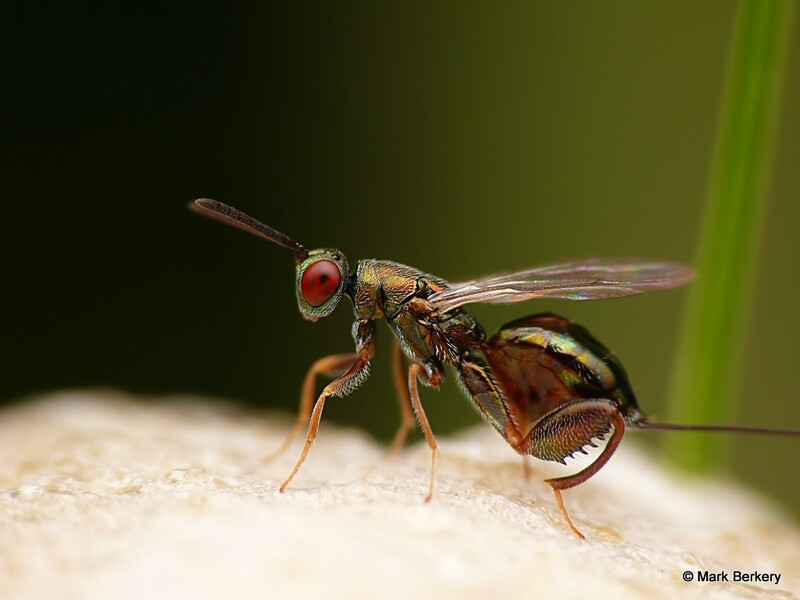 These are beautiful images, but they are of a chaclid wasp, in the femaily Torymidae, and likely in the Podagrion genus (which often use mantid egg cases as hosts). Thanks Ross. Didn’t know that. 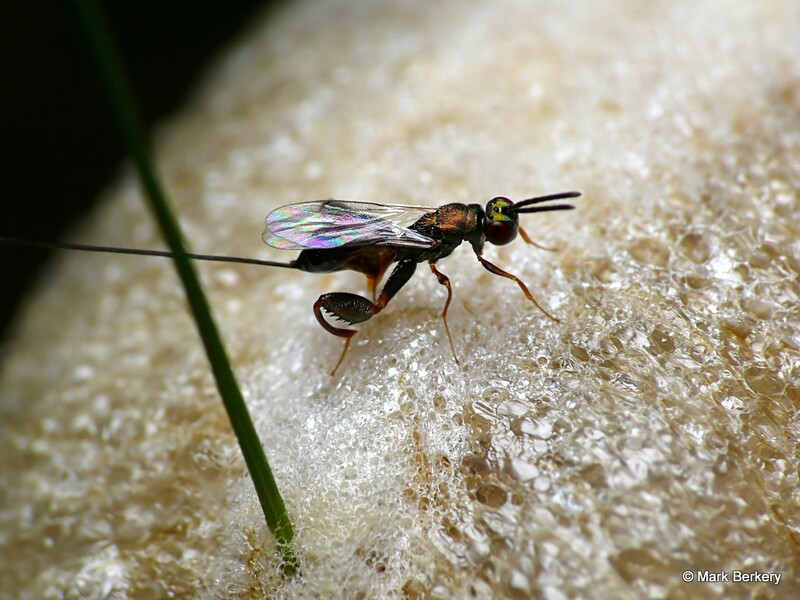 Sorry, in my haste, I misspelled a few (should be chalcid wasp in the family Torymidae). These are some of the best chalcid images I’ve seen (and I’ve seen many), so thank you. Incredible capture. Lovely photographs as always! I never get tired of your images.